The Shetland Sheepdog was developed to herd sheep, which it was capable of doing even without human supervision. It is said that in earlier days they were taken with their charges to one small island or another that was uninhabited to find better grazing. The flocks were left with only the dogs in charge until their owners returned. As a secondary task they would also bring the cows home at milking time. Today they are more commonly kept as companions, although some are still used for herding. The Shetland Sheepdog we know today differs greatly from the original sheepdog of the Shetland islands. These original dogs were small spitz breeds, similar to the Icelandic Sheepdog. Their ancestors likely included the now extinct Yakki dog from Greenland, as well as other spitz dogs from Scandinavian countries and a variety of sheepdogs from Scotland. There original type was established by the 1700s and was known as the Toonie Dog (Crofter’s Dog) or Peerie (Fairy Dog). 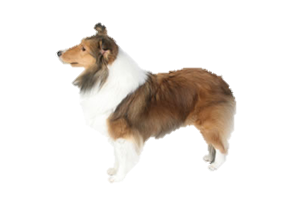 As these dogs began appearing in the mainland an outcross was eventually made with the Rough Collie which changed their appearance to match that of a miniaturized Collie. For a time the breed became known as the Dwarf Scotch Dog or Shetland Collie, but an outcry from the Rough and Smooth Collie fanciers caused the permanent name change to Shetland Sheepdog.